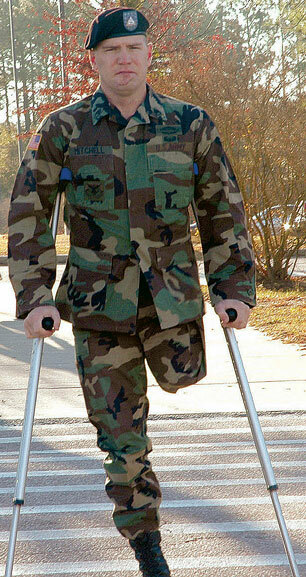 FORT JACKSON, S.C., Dec, 21, 2005 — Despite several injuries acquired during combat - to include an above-the-knee leg amputation, Staff Sgt. Roy Mitchell is not willing to let go of his 12 years in the Army without a fight. Mitchell said there wasn’t even a decision to make, because he is in this Army to retire. Mitchell is the type of soldier who although severely wounded in combat, is still willing to be a part of the fight for freedom and the military way of life. He hopes that other soldiers will see his patriotism as an inspiration to stay in the Army. Mitchell was wounded the day before Thanksgiving in 2003 on his second deployment to Afghanistan, when his vehicle hit an anti-tank mine along the Pakistani border. There to relieve a sister company in the battalion, his unit was on a leaders’ recon when the attack occurred. “The leaders from the prior company were taking us out to show us the routes that they used to get from point A to point B,” said Mitchell. He was riding in a regular Humvee that was not equipped with up-armored modifications with 11 other soldiers and two media affiliates. The insurgents had armed the device to detonate on the third strike, which happened to be the vehicle that Mitchell was traveling in. “Two other vehicles had rolled over the very same spot and nothing happened or indicated that it was a danger,” he said. ...Once his comrades determined the area was secure, they began to tend to the vehicle and realized that Mitchell was still pinned. Getting him out of the vehicle took about 25 minutes. Mitchell had a shattered jaw with severe lacerations, stress fractures throughout the face region, loss of four teeth, shattered left elbow, shrapnel wounds to the mid-section, third degree burns on 40 percent of his right leg and his left leg was amputated, which included two revision surgeries to be fitted for a prosthetic. “I was pretty beat up,” said Mitchell who spent 11 months at Walter Reed before he was able to return to Fort Drum, N.Y. Many people believe that the Department of Defense has to discharge a soldier who is wounded in action, but as long as the soldier is found fit for duty in an job that the department has to offer, they can continue their military service, Mitchell said. During the last two years he’s seen many good soldiers who were wounded make the decision to get out of the military, he said. Mitchell is at Fort Jackson taking the 79S Career Counselor course. One of the hardest things about this whole situation for Mitchell was the fear of losing touch with the day-to-day interaction with soldiers. However as a career counselor, he will still interact and affect soldiers’ lives, fulfilling one of the things he didn’t want to get away from. The Career Counselor course is eight and a half weeks and Mitchell is currently in week seven. The job consists of counseling soldiers and retaining them in the Army or helping them transition out of the Army. A soldier in Mitchell’s situation has to go through a medical evaluation board. That board determines whether to retain the soldier in their current job, to retain them and reclass them into a different job or to recommend discharge according to the best interest of the Army. Mitchell said that he doesn’t have any regrets. “Because as an infantryman, as soon as you step foot in that foreign soil, you know that there is a chance this could happen,” said Mitchell. Some people may think because of his experiences, he would scare more people off as a career counselor than retain them. However, he’s been doing the rear detachment career counselor job at the battalion level for almost a year with success. “Once I go in front of that board, I am optimistic they will see that I am already MOS qualified in a job that I can physically do the rest of my career in the Army,” Mitchell said.